The new Toro Rosso for this year turned plenty of heads, and not merely because of the rather nifty new colour scheme based on Red Bull's cola brand. Its Mercedes resemblance was clear, in general shape and in its intricacies that were right from the sort that the far better resourced Brackley squad came up with. There were many direct similarities, such as the front suspension raised for aero benefit. Craig Scarborough called the STR12 "an absolute jewel of a car". It shouldn't shock us too much either. 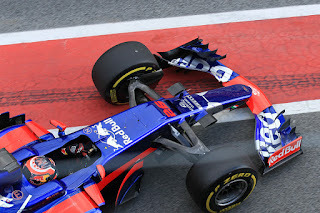 Toro Rosso under Key's direction has been producing aerodynamically-fine chassis for a number of years now (albeit ones let down on occasion in other areas such as reliability and preparation). It produced a fine chassis last season too, to the point that some speculated about podium finishes in the early rounds. But the downside of having a year-old Ferrari engine (due to being left high and dry - and late - by its big brother team's spat with Renault) was foreseeable and foreseen. Not only was accepting the engine at such a late moment of the chassis's development problematic, the unit also stood still as the season progressed while all others around it improved. This year it's nipped that one in the bud by returning to Renault, and Key recognises that the French concern has "turned a huge corner" on performance. However the opening test was underwhelming for Toro Rosso, with some reliability problems meaning the STR12 clocked the lowest mileage of all (yep, lower even than McLaren) and it was lowest in the lap time ranking too. Its earlier filming day also was halted early by a Renault problem. But the sense of the car's latent promise lived on - "it looks good, it looks fast" opined team principal Franz Tost. It all meant Key described the opening gathering as "encouraging but frustrating". The second test was perhaps tilted a bit more towards encouraging - Carlos Sainz set third fastest time on the final day while the car got more than double the mileage of the opening test - but the team still was frustrated by (usually Renault) problems curtailing running. Key admitted that with it all the car's not quite yet in its set-up window. Still no one doubts the machine's potential; that even in the here and now it's in the thick of the midfield mix and perhaps could be near or at the front of it once all niggles are fixed. Tost said at the launch that he's "optimistic that Toro Rosso will be in the front part of this midfield" and that a best-ever fifth place in the constructors' championship is the target. Given everything that looks an achievable aim. The Red Bull collective clearly sees something in Daniil Kvyat, given it skipped on its own notorious ruthless ways to retain his services for this season. Moreover such was a lot of his 2016 campaign that even a team boss from the extreme benevolent wing of F1 decision-making would have struggled to make a case to keep him on. His season was for a time like one of those scenes of carnage that you felt you shouldn't look at but somehow couldn't quite avert your eyes from. He was dumped unceremoniously by the Red Bull big team after just four rounds to make way for the prodigious Max Verstappen (aided by Kvyat getting nowhere near Daniel Ricciardo on pace), and back at Toro Rosso the Russian appeared to be unravelling further. After Germany's qualifying he was so bewildered indeed that we feared genuinely for his well-being. But the turning point was only a day away as he put in a much improved race performance in Hockenheim, and followed that up with a decent if not necessarily spectacular latter part of the season. And somehow it ended as an unlikely tale of salvation as outlined, even though the latest off the Red Bull conveyor belt Pierre Gasly was on the way to bagging the GP2 crown. 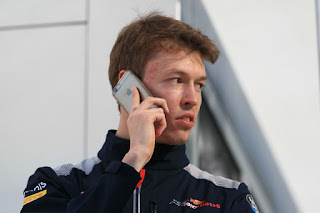 On a certain level we can understand the decision to stick with Kvyat, as when he's good he's very good. But this perhaps is the crux - apparently Kvyat's is an ultra-aggressive style that requires everything underneath him to be just so to get the best out of it. Yet how often is everything just so? Entering year four of his F1 existence he needs to somehow find an ability to string together his highs with far greater regularity. 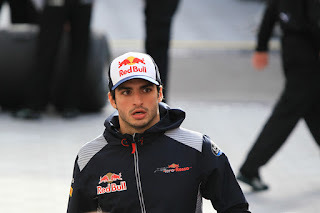 One of things to be glad of about the last F1 season is that in it Carlos Sainz stepped out of Max Verstappen's shadow to get his own proper due. Some in the Toro Rosso team reckoned Sainz only really stepped up once Verstappen had left the team early that campaign. But that on the face of it seems harsh as for the year-and-a-bit they were paired there rarely was much if anything to choose between Sainz and the epoch-making Dutchman. Perhaps too it reflects that it was only as Max won ever more friends in a front-running drive that Sainz's ability - by way of comparison - was brought into its proper focus. He scored on ten occasions in 2016 and made Q3 nine times, the latter showing there's nothing wrong with his raw pace. In many rounds he finished several places higher than he started; usually these were places higher than his car deserved. He likely would have got a podium appearance - only the team's second ever - in Monaco but for a botched pit stop. In Brazil he showed not for the first time that he's superb in the wet. He also in many rounds demonstrated Alonso-like on-track feistiness. Mistakes were few. All was achieved too in a car sliding inevitably from the pace as the season went on. Sainz, in keeping with his character, simply shrugged and reckoned the adversity made him a better pilot. His lucid and sober ways ensure that he is one who seeks always to improve. Some even ended the year thinking him a champion of the future, and clearly Red Bull agrees there's something special that it needs to clutch tight, given the firm way it rebuffed various potential suitors of Sainz's last summer and kept him on at Toro Rosso for a third year. Certainly teams capable of winning championships - and not just Red Bull - could do infinitely worse than give him a drive. 2017 F1 Betting Preview - Flutter on Ferrari?